Perhaps the greatest demonstration of sustainable transport in one of the most dramatic settings on earth. From Victoria Falls, Zambia, through Namibia to Cape Town, South Africa. 2,500 miles (4,000km). 12 days, 11 nights. Open to electric, solar, hybrid, biofuel and hydrogen vehicles to highlight the importance of renewable energy and, in particular, carbon neutral transport. Immediately after the finish in Cape Town, there will be a conference focusing on renewable energy and potential applications for development, especially in the context of Southern Africa. The rally will start at Victoria Falls, on the Zambian side, from where it will cover 200 kms through Zambia, crossing into Namibia over the Zambezi river at Sesheke to Katima Mulilo. 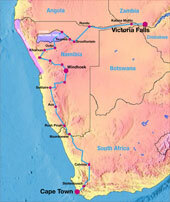 It will then pass through the Caprivi Strip, (avoiding the elephants), and down to Grootfontein. From there it heads to Tsumeb and then the world famous Etosha National Park where, once again, the vehicles will have to give way to lions, elephants and zebras. Once out of Etosha, the rally will head past the Brandberg mountain, home to more than 4500 ancient rock paintings, to the old mining town of Uis. Much of this part of the rally will be on gravel roads which will provide an extra challenge to the entrants. From Uis, the route takes the entrants up onto the high plateau where they will finish the first half of the rally at the capital of Namibia, Windhoek. In Windhoek, for some there will be a rest day, for others a chance to fix up their vehicles and then sample typical Namibian hospitality. On the following day, the entrants will head south to Rehoboth and then turn west down to Solitaire where they will camp under the amazing night sky of the Namib Desert (the oldest desert in the world). From there, the entrants head south down to Aus, situated on the edge of the Sperrgebiet, the old diamond mining area. From Aus, they head for Rosh Pinah, another mining town, and from there to the Orange River, where they turn east, along to Noordoewer.